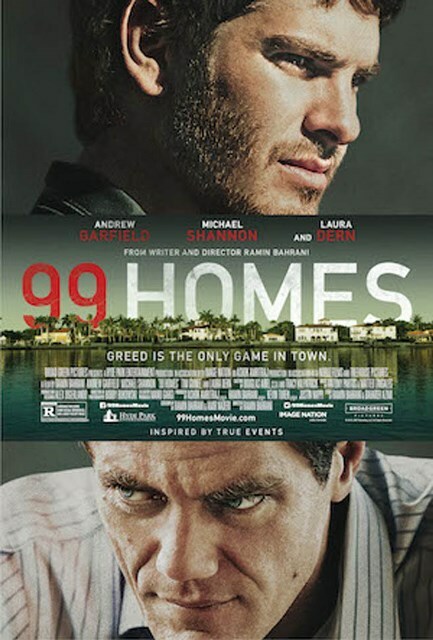 Ramin Bahrani’s latest film, 99 Homes, makes for an interesting companion piece to Spotlight and the lesser Sicario, in that all three films deal with disillusionment and the corruption of an idealized system. Spotlight examines the putrid rot at the core of an ancient organization that’s become more interested in silly hats than people, Sicario takes us through the decayed morality of the drug war, and 99 Homes is a nightmarish look at the predatory disenfranchisement of the economic collapse of the late aughts. 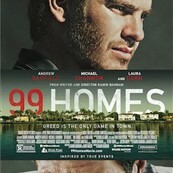 Co-written and directed by Bahrani, 99 Homes is not as consistently compelling as the stellar Spotlight, but by using the trappings of a thriller, and leaning on two very strong performances from Andrew Garfield and Michael Shannon, Bahrani milks the film for all the desperation he can. 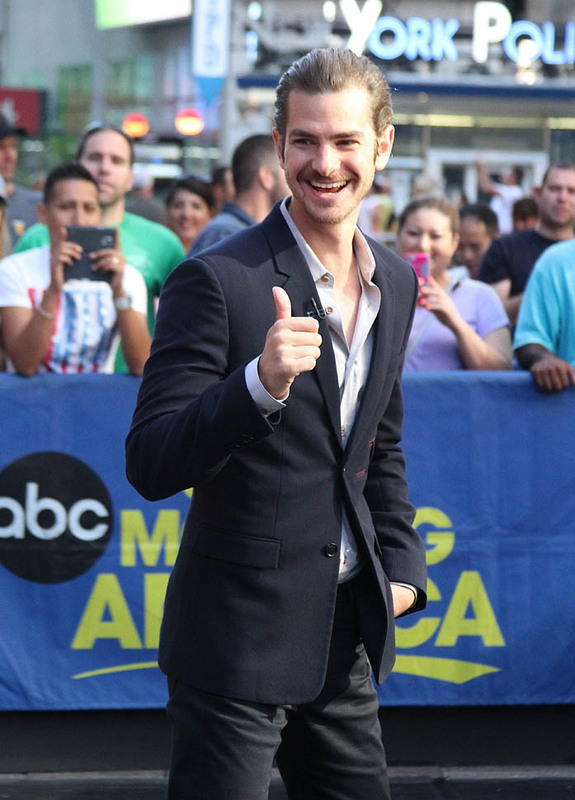 Garfield stars as Dennis, a single father maintaining the home he grew up in for his own son, Connor (Noah Lomax) and mother, Lynn (Laura Dern, cornering the market on “frazzled mom”). Unfortunately, the economic collapse has put Dennis, a construction worker, out of work as the Florida housing market collapsed, too. Behind on his mortgage, Dennis and his family are unceremoniously booted from their home in a scene that perfectly combines tension, desperation, and humiliation. From there, things only get worse for Dennis as he and his family are forced into a hotel where other evicted families reside. In an effort to get back into his home, Dennis ends up making a Faustian bargain that plays out exactly like you think it will. It undercuts the drama somewhat, but Garfield and Shannon are compelling enough to make up for it. There are plot holes in 99 Homes the size of Mac trucks, and the plot unfolds along a chain reaction of conveniences and not actual circumstances, but for the most part you can blow right past the hang-ups because the narrative unfolding feels real despite frequent “movie moment” contrivances. The degradation of Dennis’s plight and his I’ll-do-anything willingness to sell out in order to provide for his family is emotionally harrowing, and it’s only made worse when he’s exploited by the very man who rendered him homeless. 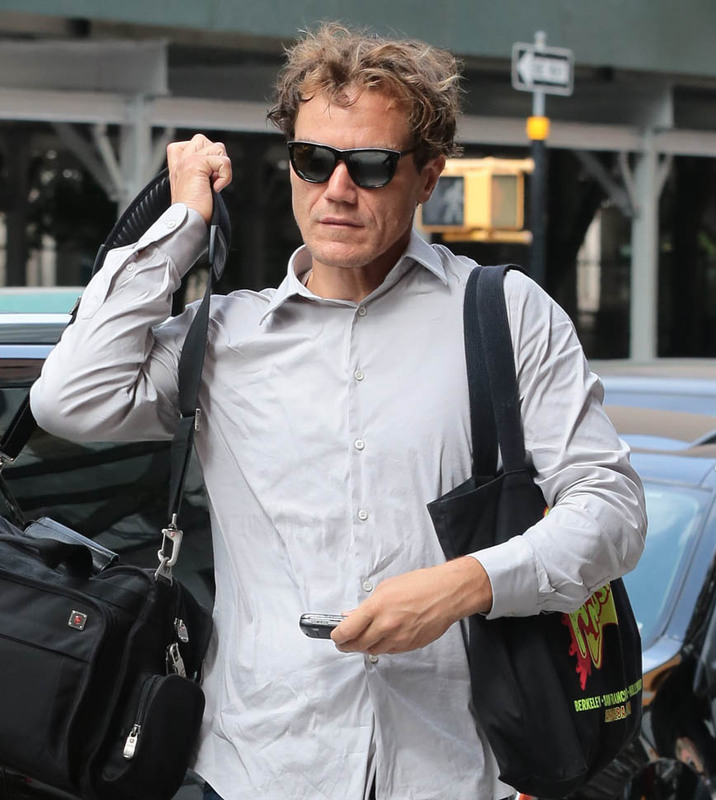 Garfield is very good as Dennis, but Michael Shannon steals the whole movie as ruthless foreclosure expert Rick Carver. Shannon plays Carver as a dead-eyed shark who’s made a fortune on other people’s misery, and Dennis quickly goes to work for him to try and earn back his house. Carver’s influence is predictably corrupting, and soon getting his house back isn’t enough and Dennis wants MORE. As humiliating as Dennis’s eviction scene is, it’s worse when he’s the one doing the evicting. Carver manages evictions with a ruthless efficiency that makes it easy to despise him, but Dennis is actually sympathetic, which makes it all the more cruel when he boots people from their homes. It’s actually one of the weak spots of the film, that Carver has absolutely no redeeming qualities. He’s the villain, and we’re not required to like him, but by depriving him of any trace of real humanity he becomes a caricature, which plays into the increasingly ridiculous climax that is another weak spot. The ending of 99 Homes goes full-Hollywood, complete with mustache-twirling villain, and while this isn’t a particularly subtle film, the ending feels too big for a film that is mostly focused on human drama. Despite his Hollywood leads, Bahrani sticks with his naturalistic style, with a lot of hand-held camerawork and non-professional actors peppering the smaller roles. Cinematographer Bobby Bukowski blasts so much light into scenes that the Florida sunshine becomes harsh and ugly, revealing dirt, grime, and sweat. This is not a perfect film—you really have to be willing to go with the emotional story being told because logically it’s too convenient to be truly satisfying. 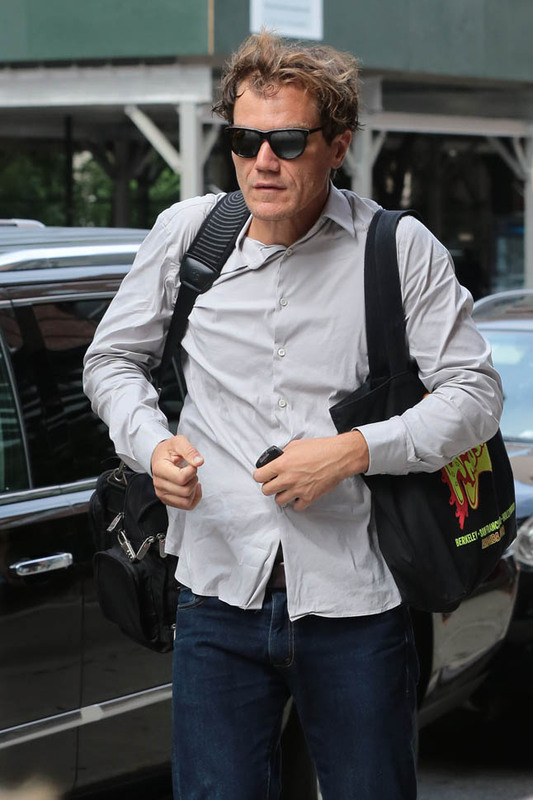 It doesn’t quite stand up there at the end, though the performances, particularly from Michael Shannon, make up for a lot. This is a grody movie, the moral dirt of the story made literal in every frame, and with a dirtbag villain you’ll want to lock inside the Wicker Man and set ablaze. It doesn’t leave you with the same righteous fury as Spotlight, but 99 Homes is an effective portrait of twenty-first century greed and exploitation. The film opens in selected cities this weekend.